Notes: The line opened on 29 October. Although he exact date the station opened is not recorded it seems unlikely that a station serving one of the larger communities would not have opened with the line. Longtown was the first town of any size after leaving Carlisle and was sited at the junction with the Gretna line, just north of the viaduct over the River Esk. 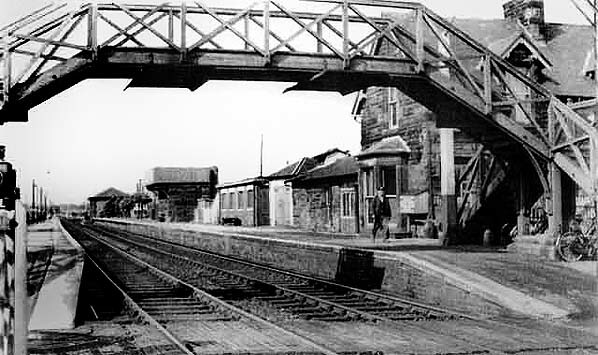 The station had two platforms spanned by a timber footbridge at their south end, immediately north of the level crossing. The main station building was on the up side, set back from the crossing to make a small forecourt. The stone building comprised a two-storey stationmaster's house facing onto the forecourt with a bay window overlooking the platform. The booking office and waiting room were in a single-storey extension facing onto the platform at the rear of the house, with a toilet at the north end. A large ornate water tank overhung the up platform just north of the station buildings. There were water columns on the up side immediately north of the level crossing and at the north end of the down platform. There was a stone waiting room on the down platform. There have been three signal boxes at Longtown. There was one box at Longtown Junction south of the level crossing on the down side of the line which survived until closure. Longtown North box controlled access to the goods yard. The third was the short-lived Longtown Viaduct box. The moderate sized goods yard was on the up side north of the station and comprised four sidings with a 5-ton crane between them; all were loops with access from both directions. The siding nearest the main line passed the large cattle dock then ran through a large goods shed before rejoining the line. A fifth short siding ran end-on to the dock. The siding at the rear of the yard served a coal and lime depot. Access to the yard was from the station forecourt to the rear of the house. A two-road engine shed opened to the north of the station on the up side on 15 October 1861. It closed c.1924 and was subsequently demolished. 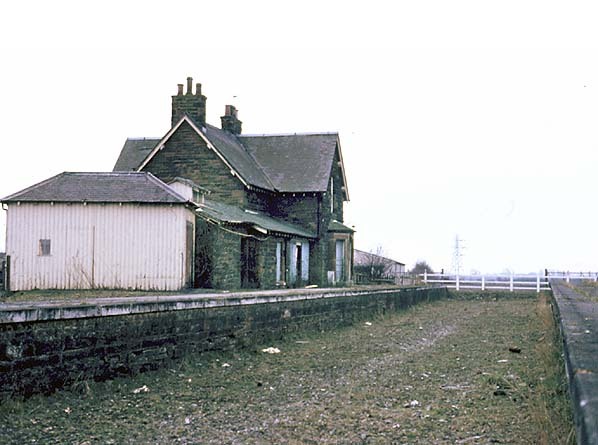 The station closed to passenger traffic on 6 January 1969 but remained open for goods traffic until 31 August 1970 with a private siding remaining in use after that date. The Waverley route was a double-track railway line that ran south from Edinburgh in Scotland through Midlothian and the Scottish Borders to Carlisle in England. It was built by the North British Railway Company; the first section, from Edinburgh to Hawick opened in 1849. The final section, Hawick to Carlisle, opened in 1862. It was named the Waverley route after the novel by Sir Walter Scott (who was born in Edinburgh and eventually lived near Melrose). The line closed to passengers in 1969, but reconstruction work of the Edinburgh-Galashiels-Tweedbank section was scheduled to begin in 2008, and is now anticipated for 2011. The Edinburgh and Dalkeith (‘Innocent’) Railway, was the first to serve Scotland’s capital city. It carried coal from the mines in Lothian to its city centre terminus at St Leonards. It received Royal Assent on 26 May 1826 as a horse-drawn tramway built to the Scottish gauge of 4 ft 6 in and linked various coal mines to the south-east of Edinburgh. The line was commissioned by a business consortium led by Walter Montagu-Douglas-Scott, 5th Duke of Buccleuch, with the engineering plans being contributed by Robert Stevenson. Two further Acts were obtained; the first, on 4 June 1829, sanctioned the Leith Branch, running from Niddrie to Leith. The second, in 1834, authorised further branches to Fisherrow and Musselburgh and allowed a certain amount of passenger traffic by horse-drawn railway coaches. The first section of the line opened for goods traffic from Edinburgh St Leonards to Craighall Colliery, between Niddrie and Millerhill, on 4 July 1831. This was extended to South Esk (renamed Dalhousie in July 1847) in October 1831 with a branch to Dalkeith opening on 26 November 1838. A full passenger service was introduced by the contractor MJ Fox between St. Leonards and South Esk on 2 June 1832; this quickly proved profitable, and the company started operating its own passenger trains in 1834, taking over all passenger workings in 1836 with a service to Dalkeith opening in autumn 1839. There were no fixed stopping places with passengers joining and alighting wherever they requested; as a result there were no tickets. By 1843 some 'authorised' stopping places had been agreed, and an 1844 map produced by the North British Railway showed stations at Portobello, Niddrie Junction, Cairney, Sheriffhall, and Lasswade Road (at, or near, the later Eskbank station). The North British Railway made an approach to buy the line, which would be incorporated into a proposed new route between Edinburgh and Hawick; this received parliamentary authorisation in 1845. Due to the ongoing success of the existing enterprise, the NBR had to pay the high price of £113,000, the sale being completed in October 1845. It appears that some alteration to the course of the line was made between 1838 and March 1844 when the NBR produced a map showing its plans for route. The line was subsequently converted to standard gauge and doubled, reopening to Dalhousie in July 1847. The stations at Cairney, Sheriffhall and Lasswade Road were not reopened. Construction of the extension to Hawick was rapid, opening in stages as the line forged its way south. 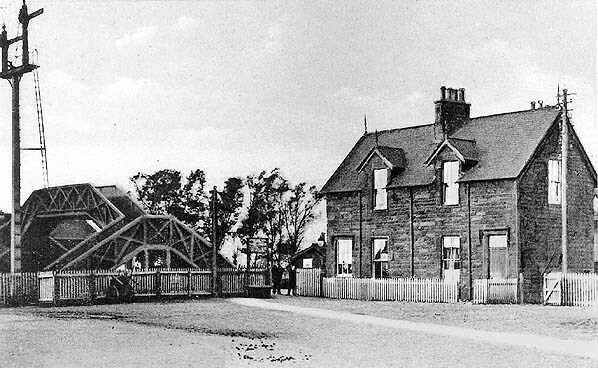 Gorebridge opened on 14 July 1847 and by 20 February 1849 it had reached Galashiels, finally arriving at Hawick, where a terminus was opened on 1 November 1849. By this date there was considerable rivalry between railway companies, and this soon turned into acrimony, with opposing plans to extend south into England. In 1846 the NBR applied to Parliament for further powers to extend the line through Langholm to Carlisle. The Caledonian Railway opposed this extension, and in due course the North British Company’s plans were thrown out by the government committee. Matters dragged slowly on, with meetings in Hawick of many of the manufacturers who felt the need for a railway to the south. No substantial progress was made until 1856 when a survey was made of the Liddesdale route. The Caledonian Railway also had plans for a station in the Lower Haugh in Hawick, with a railway through Teviotdale and Langholm to Carlisle. To the astonishment of many inhabitants, the claims of the Langholm line were approved and those of the Liddesdale scheme rejected. So indignant were the supporters of the Liddesdale railway that a meeting outside the Town Hall in Hawick attracted some sixteen hundred people expressing the view that the decision was totally against the wishes of the people of the south of Scotland. An appeal was taken to the House of Lords which resulted in the Langholm Bill being thrown out. In 1859, the railway battle raged again before Parliament, and on the 21 July 1859, having changed its name from the Hawick & Carlisle Junction Railway, the Border Union (North British) Railway Act received the Royal Assent - the North British Railway had won at last. Langholm had come close to having a through line to Hawick, worked by the Caledonian Railway Company, but it had to be content with a branch line from the Liddesdale route. Another line from Longtown to Gretna, to connect with the Glasgow and South Western Railway, was also included in the Act. Within six weeks construction was underway at Hawick with intense interest from the townsfolk. The first sod was cut on 7 September 1859, and the day was declared a public holiday in the town with special trains bringing visitors from the north. As the railhead progressed south sightseeing tours were arranged from the town to view the construction. original terminus at Hawick was closed (becoming the town's goods station) and a new through station was built on a new alignment to the south, taking the line on a viaduct high above the River Teviot. Beyond Hawick the line passed through difficult terrain requiring heavy engineering works, with steep gradients and viaducts (notably the magnificent 15-arch structure near Shankend) before reaching the 1208 yd summit tunnel at Whitrope, 1006 ft above sea level. South of Hawick a deviation from the original route took the line close to Stobs Castle in the hope that a station there might generate passenger revenue in the future, despite a tiny local population. In fact many of the new stations did not serve any sizeable communities; it was hoped that that these stations would attract traffic from the surrounding farms giving them the opportunity to send their produce to market. Two miles south of the summit in the 'middle of nowhere' the NBR built what was to become one of the most famous junction stations in Britain in the heart of the Lees Bog. 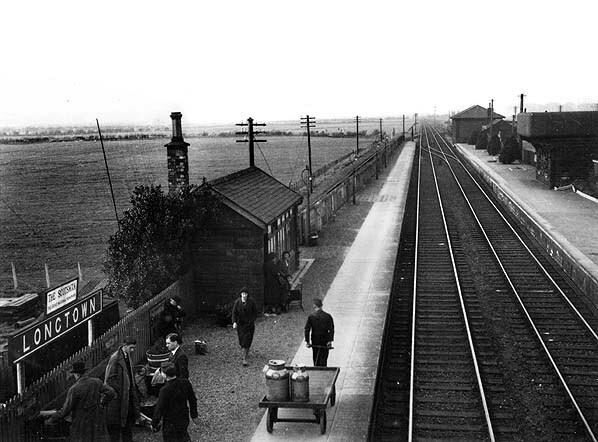 Prior to the railway, apart from a remote shepherd’s bothy, there were no buildings or inhabitants in the area, but the railway brought its own community in the form of Riccarton railway village comprising terraced housing, a shop on the station platform, a school and a three-road engine shed with room for six locomotives; a two-road carriage shed, two signal boxes, a gas plant, turntable and coaling facilities were also provided. At Riccarton, the line made a junction with the Border Counties line extension running through Reedsmouth and Bellingham to the Tyne Valley line at Hexham. The new community at Riccarton, 1 ½ miles from the nearest road, had no doctor, so a light engine was kept permanently in steam at Hawick to convey emergency services to the village when required. 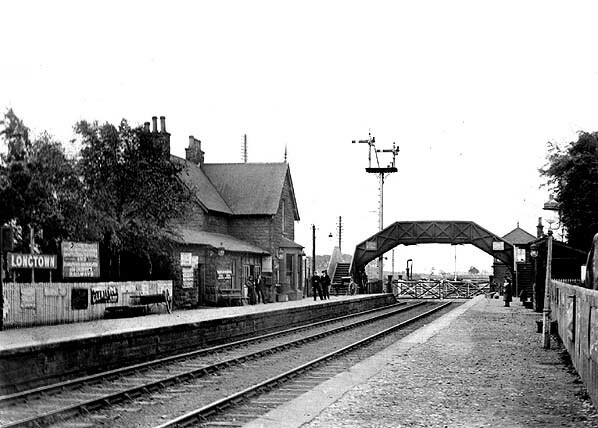 Initially Sunday worshippers used the engine shed, then the waiting room, a minister walking from Saughtree on the Border Counties line to officiate at the services. Eventually church trains were provided to take worshippers to Newcastleton and Hawick on alternate Sundays. As the Borders Counties line was already open, Riccarton opened early, before all the railway facilities were completed. The line continued south through open country before reaching Newcastleton, the first community of any size since leaving Hawick, 21 miles to the north. Three miles further south the line crossed into England at Kershopefoot. A further six miles south was Canobie Junction (later to become Riddings Junction), the junction for the Langholm branch which opened to Canobie (later called Canonbie) in May 1862, and to Langholm on 14 April 1864. The only other major settlement on the route was Longtown. The original plan was to join the Caledonian Railway at Rockliffe, four miles north of Carlisle, but with so much animosity between the two companies the NBR were forced to seek an alternative route into Carlisle, joining the Port Carlisle & Silloth Railway (which they later absorbed at Canal Junction) a mile north-west of the town centre, after which it eventually joined the Caledonian for the final short run into Carlisle Citadel station. The new line opened in four stages, with goods traffic running between Canal yard in Carlisle and Scotch Dyke from 15 October 1861 and passenger traffic commencing over that section on 30 October. The line from Longtown to Gretna opened on 1 November 1861. The section between Scotch Dyke and Newcastleton opened to traffic on 1 March 1862, with Newcastleton to Riccarton Junction following on 2 June 1862. Finally, the Riccarton to Hawick section opened with through freight trains to Edinburgh, running from 23 June 1862, and passenger services were introduced on 1 July 1862. Although the line had been engineered for double-track only a single track was laid between Riddings and Riccarton, but this had been doubled by 1863. Initially traffic over the southern section of the route was very limited, and the board considered selling that part of the line, or - if no buyer was forthcoming - closing it. However, with the opening of the Settle & Carlisle line in 1876, passenger numbers improved with through trains running from St Pancras station in London: St. Pancras to Edinburgh became renowned as one of Britain’s most scenic main line railways. The significant gradients and bleak moorland terrain made the Waverley arguably the most difficult line in the UK for steam locomotive crews to work. From Edinburgh Waverley the climb started on the city outskirts, continuing for several miles at 1 in 80, with a moorland summit at Falahill loop. It then descended at a similar rate to the woollen manufacturing towns of Galashiels, Melrose and St Boswells and through the fertile farmland of mid-Tweeddale and Teviotdale before reaching Hawick and ascending for twelve miles at 1 in 80 again through Stobs and Shankend to Whitrope Summit, the highest point on the line amidst desolate moorland. Following Whitrope Tunnel, the line descended at an unbroken 1 in 75 for over eight miles through Riccarton Junction and Steele Road to Newcastleton. Following this, easier gradients led the route to Carlisle down the valley of Liddell Water and into the plains surrounding the Solway Firth. In 1923 the North British Railway came under the jurisdiction of the London & North Eastern Railway (LNER) at the Grouping. However the two expresses from London had traditionally run via the Midland Railway's main line. Since the Midland became part of the London Midland & Scottish Railway (LMS) group, the daytime ‘Waverley' express and overnight sleeping car train would be hauled by LMS locomotives to Carlisle, then switch to an LNER locomotive for the final leg to Edinburgh Waverley. The expresses were limited-stop, and in the 1950s they covered the mileage from Carlisle to Edinburgh in roughly two-and-a-half hours. Motive power was usually in the form of a Gresley A3 Pacific locomotive, a class unsuited to hill climbing. With large driving wheels and three cylinders they were designed for running long stretches in excess of 80 mph on heavy expresses; however the 'Waverley' express was typically eight coaches in length, and speeds on the Waverley Route were limited to 70 mph, and the many tight curves required more severe speed restrictions. On the climb from Newcastleton to Whitrope Summit the train would be down to 30 mph by Steele Road, with the locomotive being worked flat out. Other passenger services (usually three per day) were also worked by A3s, although Thompson B1 4-6-0s made regular appearances. There was also a daily Gresley A4 diagram between Edinburgh and Carlisle - an overnight fitted freight southbound, returning with the early morning parcels train. Thompson Pacifics appeared later on, just before the line was dieselised, in a drive for efficiency. In addition there were also several local passenger workings between Galashiels and Edinburgh (some via the Peebles loop, which opened in stages between Galashiels and Eskbank between 4 July 1855 and 1 October 1864) and between Hawick and Carlisle. These tended to be hauled by B1s. After the end of steam, a variety of diesels worked passenger trains, especially Class 24 and 26 Sulzer-engined diesels, and even Class 17 (Claytons) on local stoppers. Long distance loco-hauled trains were often covered by Class 45 (Peaks). DMUs worked the local services between Galashiels and Edinburgh. Freight workings were heavy and frequent, hauled by a multitude of classes. The significant workings were pulled by Gresley V2 2-6-2s and Gresley K3 2-6-0s as well as A3s. 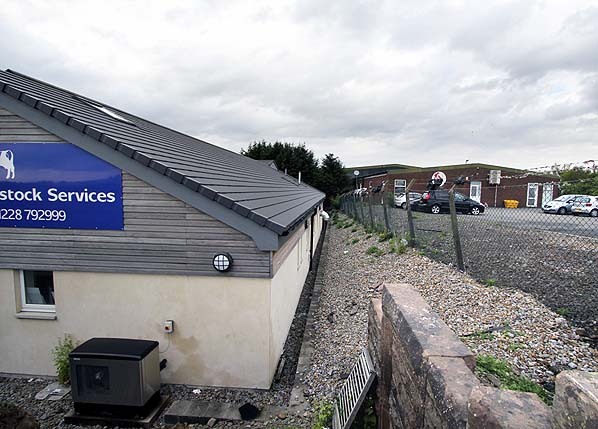 V2s provided service for over 30 years. In the 1960s, once the short-lived marshalling yards at Carlisle Kingmoor and Edinburgh Millerhill were opened, they worked hourly freights through the day and night. Depending on the maximum speed of the freight working, a Carlisle to Edinburgh freight could take anything from four to seven hours to travel the route. There were also stopping freight trains that worked from Hawick to Edinburgh and Hawick to Carlisle and back, each taking a full day to complete the round trip, stopping to shunt at every station yard. These tended to be hauled by J39 0-6-0 locomotives, although BR standard class 4 2-6-0s replaced them later on. One notable working in later years was a daily Halewood (Liverpool) to Bathgate freight train carrying Ford cars on carflats. Due to the heavy load, the booked motive power was a Gresley V2 and a Stanier Class 5 double-headed, usually with the V2 on the front. At Nationalisation almost the entire Waverley route was given to the Scottish Region, of which 16 miles were within Cumberland (England) from Kershope Foot to Harker inclusive. In 1959 the London Midland / Scottish regional boundary was adjusted to be a little south of Riddings, transferring Longtown and the closed Scotch Dyke stations to the LMR. This arrangement still allowed the Langholm branch to be directly connected to the Scottish Region at Riddings Junction. LM totems were fitted at Longtown and Scottish ones at Riddings Junction (and the three Langholm branch stations), Hawick, Melrose, Galashiels, Stow, Fountainhall, Heriot, Tynehead, Gorebridge, Eskbank & Dalkeith. Until closure LNER nameplates were retained at Riccarton Junction and St Boswells. The Waverley Route was included in the list of passenger services to be withdrawn under the ‘Beeching Axe’. In October 1966 British Rail gave notice to close the line from 2 January 1967, with closure notices posted at all stations. A brief reprieve was announced, and the situation was on hold pending review; however on 15 July 1968 the Minister of Transport, Richard Marsh, gave the final order that the line would close in January 1969. A huge public outcry ensued, and there followed a high profile campaign to save the line. This ultimately was unsuccessful in preventing the closure. In spite of the protests, the line was closed on Monday 6 January 1969. The last passenger service on the line (and the last train to traverse the entire route) was 1M82 21.56 Edinburgh - St. Pancras sleeper, on Sunday 5 January 1969, hauled by Class 45 D60 ‘Lytham St Annes’. Feelings were running high along the route on the final weekend of passenger operations, with protestors evident at most stations. Anticipating the potential trouble, the authorities sent a Clayton 'pilot' engine ahead of 1M82 from Hawick to 'prove' the route south after a set of points at Hawick had been found to be tampered with. At Newcastleton, the pilot engine found the line was blocked and the level crossing gates locked by protestors. The disturbance led to the arrest of the local minister, and he was released only after David Steel, MP, who was travelling on the sleeper service, negotiated with the police. This caused 1M82 to arrive 2 hours late in Carlisle. On the afternoon of 6 January at Riddings Junction, BR staged a track-lifting 'ceremony' for the press, to split the London Midland and Scottish Regions, demonstrating their determination to close the route. After the passage of 1M82, the line was formally closed to passengers. The section between Hawick and Longtown closed completely and came under engineers’ possession for dismantling. The closure of the Waverley Route created a railway desert in the Anglo-Scottish border area. The cluster of Border towns- Hawick, St Boswells, Melrose, Galashiels (and Selkirk, closed in 1951) was left conspicuously isolated from the railway system, reliant on services at the distant stations of Carlisle, Lockerbie, Edinburgh and Berwick-upon-Tweed, and reached by roads of indifferent quality. Hawick, with a population approaching 20,000, was 43 miles from the Carlisle railhead, making it Britain’s most inaccessible town by rail. Despite its attractive scenery the area was generally bypassed by tourists, and its economy stagnated in the following decades as the traditional textile industries declined. Freight traffic continued until 28 April 1969 as far as Hawick with a daily service, mainly of coal traffic from Lady Victoria Pit. The signalling was drastically reduced after passenger closure with 'telephone and notice board' working. At the southern end of the route the line between Carlisle Kingmoor and Longtown remained open to traffic until 31 August 1970 when it was cut back to Brunthill. The section from Carlisle Kingmoor to Brunthill remains open to this day and sees periodic freight traffic. Track-lifting had begun, but was temporarily halted in early 1969 while British Rail negotiated with a private consortium, the Border Union Railway Company, to discuss buying the infrastructure. Various options were put forward to keep the route open such as singling large sections of the track and reducing the number of signal boxes; however this came to nothing, and British Rail ceased negotiations on 23 December 1969 after requesting hefty interest payments to keep the infrastructure 'in situ' while funding of the required £1 million capital was sought. An inspection saloon ran over the route in early 1970 to allow contractors to bid for the demolition work. Track-lifting started in earnest, and trains could be seen from time-to-time on the route undertaking dismantling duties. The down line between Hawick and Longtown was lifted by 1 April 1972, the up line having been lifted by February 1970. The entire route between Longtown and Newtongrange was removed by early 1972. The final stretch from Newtongrange to Millerhill was closed on 28 June 1973 and removed soon after. The last train to cross Hawick station viaduct did so on 18 April 1971. Hauled by locomotive No. D3880, it was employed on track-lifting duties, removing the line to its rear. Demolition of the viaduct over the River Teviot commenced nine months later on 1 September 1975. Omissions in the decision process have been pointed out since the closure, which might have resulted in the line remaining open. For example, construction of significant new housing in Galashiels was underway at the same time as railway closure procedures. In the late 1990s there was some discussion about reopening the southern section from Carlisle as far as Riccarton Junction. Trees in the afforested area surrounding Kielder were approaching maturity, and the significantly increased logging traffic threatened to congest the narrow roads and inconvenience the local population. Reinstating a single track was seen as an option to provide transport capacity for heavy loads, bypassing the villages, but the project was not pursued. As noted earlier, the Border towns suffered economic stagnation following the removal of their railway services. The devolved Scottish government, vested with authority to plan the nation’s transport system, was persuaded that reinstatement of the northern section of the Waverley Route could play a significant role in restoring the prosperity of the area. Consequently the Waverley Railway (Scotland) Act was passed by the Scottish Parliament by 114 votes to one; the Bill received Royal Assent in July 2006. It will reopen the line as far as Tweedbank, just south of the Burgh of Galashiels. £115 million has been allocated for the proposed route and services which will extend an existing Edinburgh suburban service from Newcraighall to Shawfair, Eskbank, Newtongrange, Gorebridge, Stow, Galashiels and Tweedbank. On 27 March 2007, Transport Minister Nicol Stephen formally initiated preparatory works. Vegetation clearance took place with a view to construction starting in 2009, the first trains expected to be running by 2011. In August 2008, the timelines were adjusted, with tendering starting in 2009, final tendering beginning in 2010, groundwork commencing in early 2011, and trains running in early 2013. In November 2009 it was announced that the reopening would be delayed for a year. The Borders Railway opened from its temporary terminus (since 2002) at Newcraighall to Tweedbank on Sunday 6 September 2015. On the previous day, however, trains were run to allow local people – holders of ‘Golden Tickets’ – to ride on their new railway. On the first day of normal services, trains which would normally be 2-car were strengthened to six in anticipation of high numbers of passengers. Class 158 and 170 diesel multiple units were used. The formal opening took place on Wednesday 9 September, when Her Majesty Queen Elizabeth II, the Duke of Edinburgh, Scottish First Minister Nicola Sturgeon and other dignitaries travelled on a special train from Edinburgh hauled by A4 No.60009 Union of South Africa. The train called at Newtongrange, where Her Majesty unveiled a plaque, then continued to Tweedbank. Here another plaque was unveiled and speeches were given by Her Majesty and the First Minister. Publicity of the occasion was intensified because the Borders Railway opening coincided with the day on which the Queen became Britain’s longest-reigning monarch. The following day the A4 locomotive began a series of 16 steam-hauled special trains, promoted jointly by ScotRail and Steam Dreams. The platforms at Galashiels and Tweedbank have been built of sufficient length to accommodate such steam charter trains, but unfortunately there are no run-round, turntable or turning triangle installations at Tweedbank, so locomotives must head and tail the trains. Although it is hoped that steam specials will continue to be a frequent feature of the line, Pritchard (Today’s Railways UK Vol.167) remarks that because of the restricted line capacity (most of which is single track) on weekdays the running of a steam special requires the cancellation of two service trains to accommodate them. He warns, ‘this situation really needs to be resolved as soon as possible to preserve the credibility of the line’. Early indications (late October 2015) are that the Borders Railway is proving popular. Station announcements have been made, almost in sombre tone, that some services scheduled for 2-cars will be formed of 4-cars. The author (AEY) on visiting the line on 21-22 October met various passengers who spoke in glowing terms, just six weeks after its inauguration, of the value of the service to their daily lives. However a local resident who had recently arrived in Stow was puzzled and disappointed by the failure of alternate trains to call there. All stations from Brunstane to Tweedbank inclusive are unstaffed and freight is not handled. erley route, with social and economic benefits for the Scottish Borders region. Tickets from Michael Stewart, Totem from Richard Furness, Bradshaw from Alan Young, route map drawn by Alan Young. Longtown station looking south before May 1907.
at the end of the up platform. 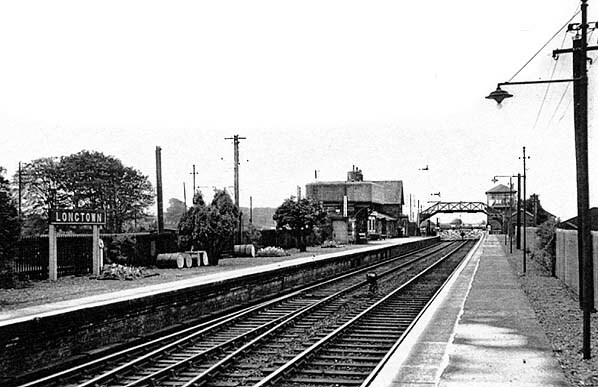 Longtown station looking south in September 1952. 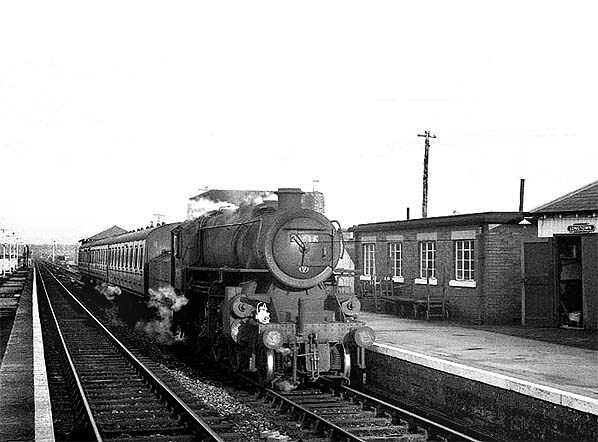 43027 draws into Longtown with the Langholm - Carlisle branch train around 1962. 43027 was built in 1949 to an Ivatt design at Horwich works. Lasting well into the final year of BR steam, it was withdrawn on 4.5.68 from 24C, Lostock Hall shed and scrapped by Arnott Young of Disndale in September of that year. These class 4 2-6-0 moguls were sometimes known as Flying Pigs due to their ugly appearance with the high running board. 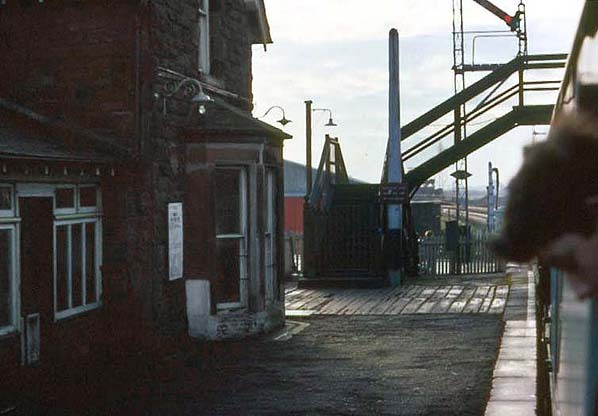 Longtown station looking north in 1960s. 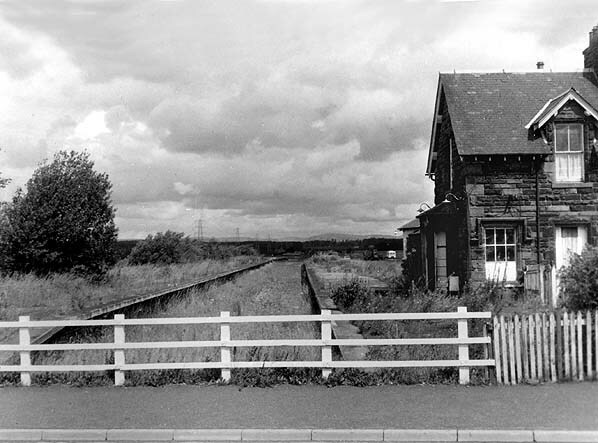 Longtown station looking north from the level crossing in July 1975. Longtown station looking south towards the level crossing in April 1978. Longtown station looking north from the site of the level crossing in May 2011.